Creamy consistency that educators prefer. Good opacity and coverage; can be used on a variety of surfaces including newspaper, cardboard, and papier-mache. Washable from skin and most washable clothing. Excellent adhesion and end result. Note: A minimum quantity of 132 must be ordered, and in units of 12 thereafter. 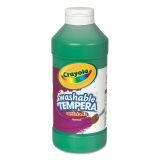 Crayola Artista II Washable Tempera Paint, Green, 16 oz - Artista II Washable Tempera Paint features an innovative formula that combines color performance and washability in one product. Ideal for classroom teachers, formula offers a creamy consistency, good opacity and coverage. With excellent adhesion and end result, paint can be used on a variety of surfaces, including newspaper, cardboard and papier mache. Good secondary color mixing allows teaching color theory. 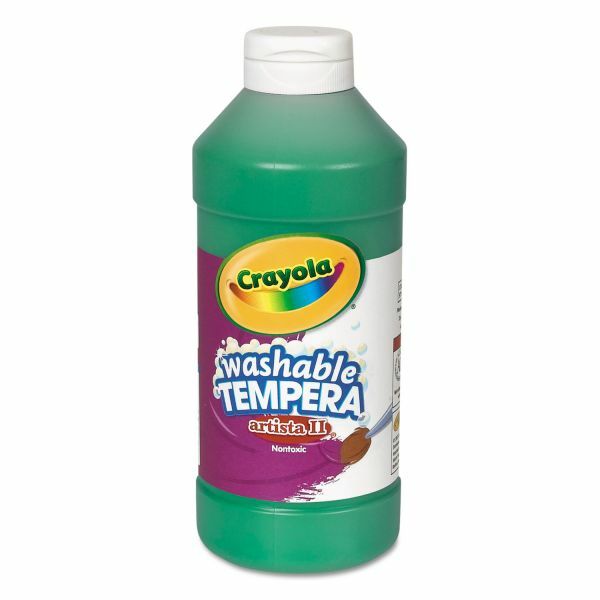 Nontoxic paint is washable from skin and most washable clothing (pre-treatment required). Good secondary color mixing for teaching color theory.